A popular fragrant shrub, Port Wine Magnolia is an evergreen flowering tree or shrub with perfumed flowers that are the colour of port wine. Flowers will appear on old wood so it makes a good flowering and fragrant hedging plant, why is this ? Because even if you prune it it will flower… simple as that. These are a slow growing plant, so advanced specimens will be costly. 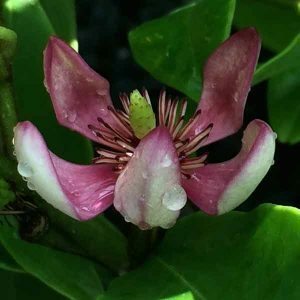 If you are looking for fantastic flowers, this is not the plant for you either, the flowers are small and fairly insignificant, but they smell great. Really very useful as a feature plant near a pathway where the fragrance can be appreciated however they are also very suitable for a low hedge. Over time a this is a tree that will reach a height of 3m but can easily be pruned back to shape and size, they can also be used as a specimen plant in a pot or container. If used as hedge, spacing for a good dense hedge should be at around .3 – .5m. Remember that they are a little slow to grow however they will will make a good hedge to around 2m in height. As they flower on old wood they make great hedges, they prune well and have smaller foliage than some others which makes for a neater hedge in a garden. A humus rich moist but well drained soil in full sun to part shade is best. These trees do require some protection from the hot afternoon sun especially in warmer climates. Before planting dig in some well rotted manure and compost and water your new planta in with some liquid seaweed solution. The beauty of the Port wine Magnolia is that it actually needs little care at all. It is evergreen, dense and slow growing and if pruning is required it take this well. Shape can be maintained by tip pruning on a regular basis, this encourages a bushy habit. Disease free in most situations. A slightly acidic soil is best (pH 6). Mulch in spring to maintain a cool root run, this is also a good time to fertilise, try a general purpose slow release fertiliser. A monthly application of a liquid seaweed fertiliser is also advantageous in areas of poor soil. The flowers are small and tend to stay as buds rather than open fully, a little sulphate of potash can help encourage flowering. The root system is fairly shallow and not regarded as invasive, excellent in paved areas. Add some compost and aged manure as a top dressing each year. The best time to prune is immediately after flowering in early summer. The flowers develop on old growth and pruning will actually encourage more flowers. Port Wine Magnolia has a number of uses in the garden, they make excellent hedges, easy to prune and they do form a good dense screen. They also flower on old wood, which means pruning will not intcruot flowering. They also make a great filler in the garden border, with good glossy foliage and being easy care they are very low maintenance. And finally as a fragrance plant they do have perfumed flowers. Although they are small and hidden in the foliage, they do have a wonderful scent, particularly on warm evenings that make this such a great plant. These are a slow growing plant, and this is actually an advantage to most gardeners as it makes an good long term solution. They are a plant that will not outgrow its position, rarely getting to more than 3 metres in height. However if you are looking for a ‘quick growing hedge’ then this may not be the plant for you. Problems can be caused by over watering or a mineral deficiency yellow leaves are often the first sign. If you are growing in a container provide some shade for the container itself so the root system remains cool. Yellow or browning leaves can indicate a mineral deficiency, try some chelated iron. Lack of flowers. Some sulphate of potash can help, water well first. apply as per directions. Also watch out for possums that eat the buds. In warmer climates such as Perth and Adelaide, hot summers can be tough on theses trees. Provide a little extra shade, mulch well to maintain moisture and they should survive. In Sydney, the plant is also easy to grow, it will prefer a deep rich soil rather than the poorer sandy and coastal soil, however with a little soil amendment you can grow them in all but the harshest areas. Growth Rate – Slow, faster in warmer humid climates. Landscaping Uses – Fragrant Hedge, or as a perfumed plant in the border. Fertilizer – Use a slow release general purpose fertilizer.